Hand Drawn Vector Abstract Cartoon Graphic Summer Time Underwater Illustrations Seamless Pattern With Coral Reefs,jellyfish,seahorse And Different Fishes Isolated On White Background. Lizenzfrei Nutzbare Vektorgrafiken, Clip Arts, Illustrationen. Image 117257720. Standard-Bild - Hand drawn vector abstract cartoon graphic summer time underwater illustrations seamless pattern with coral reefs,jellyfish,seahorse and different fishes isolated on white background. 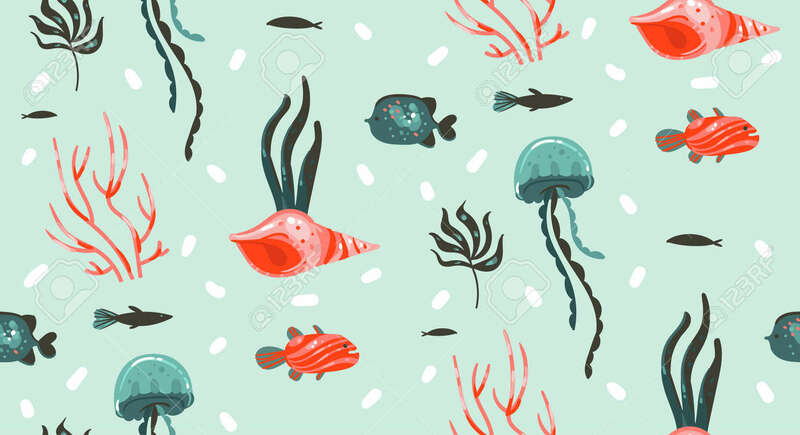 Hand drawn vector abstract cartoon graphic summer time underwater illustrations seamless pattern with coral reefs,jellyfish,seahorse and different fishes isolated on white background.